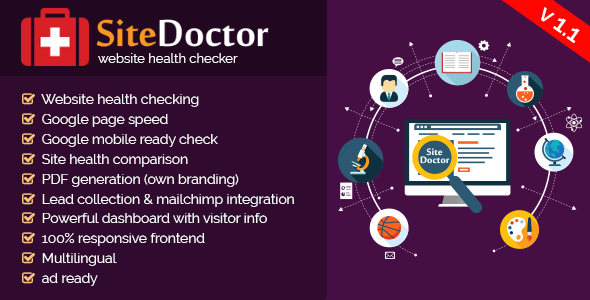 SiteDoctor v1.1 - website health checker - CODELISTPRO | Free Premium Scripts, Plugins, Apps Source Code. SideDoctor can check your website’s health status within a minute. Follow the suggestion provided by the SiteDoctor and make your site more SEO friendly. SiteDoctor will analysis all metrics of your website such as title, description, keyword, tag, page size, page speed, server status, compression status, mobile friendly status, image/css/javacript status and many more other important metrics of your website.